It started as an occupation in a park but it has caused a mass protest. Oren Ziv has taken these amazing photos of the anti-government movement. Anti-government protesters are on the streets in Istanbul, Ankara, Izmir and many other places around Turkey. They want the Prime Minister Recep Tayyip Erdoğan to resign. The mass demonstrations started after people were fighting against a plan to build in Gezi Park, in Taksim Square, central Istanbul. Police and protesters fighting, when police tried to make all the people leave Taksim Square: On 28 May 2013, Turkish police went into Gezi Park and attacked a small group of activists. The group had been in the park to stop the plans to take away all the trees and redevelop the park as a shopping mall and museum. More people joined the protest to support them, and police tried to stop them with violence, arresting many people, tear gas, plastic bullets and water canons. 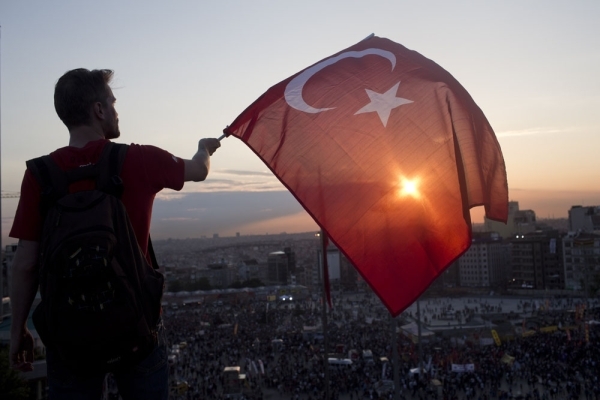 A protester with a Turkish flag on a roof in Taksim Square: As more people found out about the violence of the police, more and more people joined the demonstrations. Many of these people were protesting for the first time in their lives. 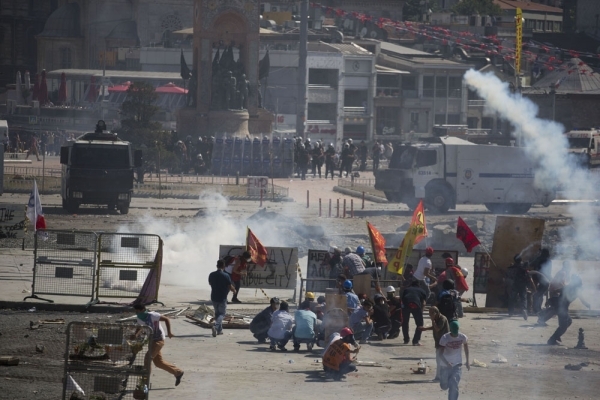 On Friday May 31police took control of Taksim Square and Gezi Park. They forced all the people to leave. There were mass protests and riots. Eventually the police left the area. 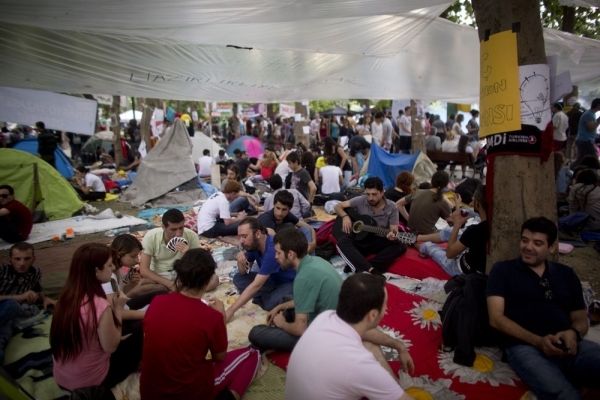 Protesters play cards and rest near their tents, in Gezi Park: Protesters set up a camp in Gezi Park, put up tents, a clinic, a public kitchen and a library. Tens of thousands of people came to show their support. The movement is now not just about taking away the trees in the park but asking for the prime minister to resign. The protesters are against his plans to develop Istanbul, and new laws that will limit personal freedom. 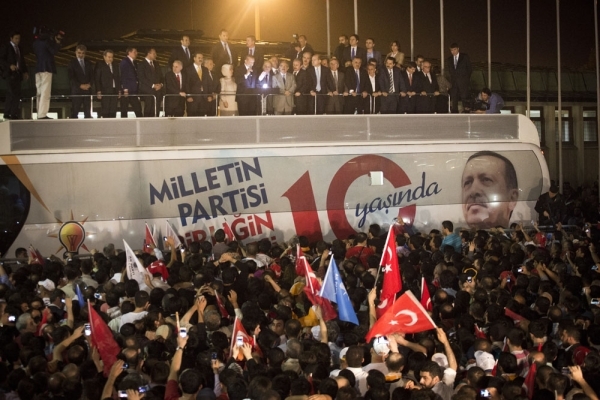 Erdoğan speaks during a support demo in Istanbul airport: The prime minister has said protesters are violent and drunk. He ordered police to get all the people out of Taksim Square. So the police went in on the morning of Tuesday 11 June. And he gave the activists 24 hours to leave Gezi Park. Protesters there expect police to come very soon. 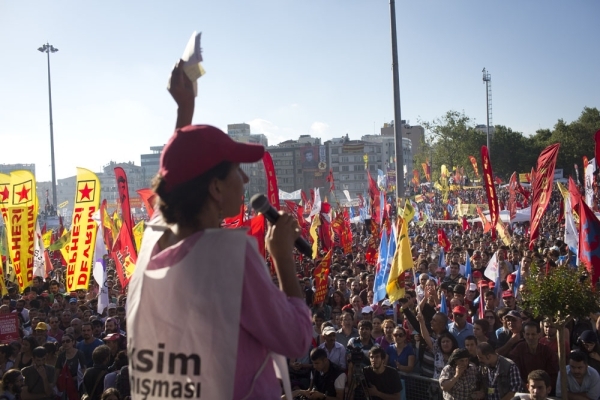 Erdoğan organized demonstrations to support himself, in Istanbul and Ankara, saying he can bring more people to the streets than the protest movement, which is growing. Police arrest a youth during a night protest: As police made people leave Taksim square, there was fighting between activists and police. Since the beginning of the protests, over 1,000 people have been arrested, and hundreds injuries. Protesters holding hands as police use tear gas in Taksim Square: Even if all people are forced to leave Gezi Park, it seems the anti-government protests will continue. In Taksim Square and other cities around Turkey it seems people have lost their fear of the police and the government, and each attack brings more people to join the movement and show support. This page was last edited on 22 June 2013, at 20:24.